According to bulk density are divided into:low density,medium density. Product specifications are:,20/40mesh between 30/50mesh,40/70mesh and so on. 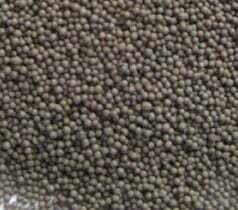 Proppant, with as its petroleum fracturing proppant scientific name, is a kind of high strength alloy pellet sintered with several kinds of metal materials and mainly used as the proppant of oil layer cracks in the exploitation and fracturing of oil fields. The application method is to deliver proppant and fracturing fluid with high pressure pump to oil layer, and then extract the fracturing fluid from oil well after being diluted with water to fix the proppant in cracks under the well to prevent cracks from closing due to over high pressure of earth crust after extracting oil, which will cause oil wells useless. It is used to enhance oil yield and prolong service life of oil wells. This product is widely used in oil fields all over the world with apparent.